In my family, my mom and I are both known as “cherry monsters.” We will easily devour a large bag of cherries in one sitting, taking full advantage of the brief cherry season. 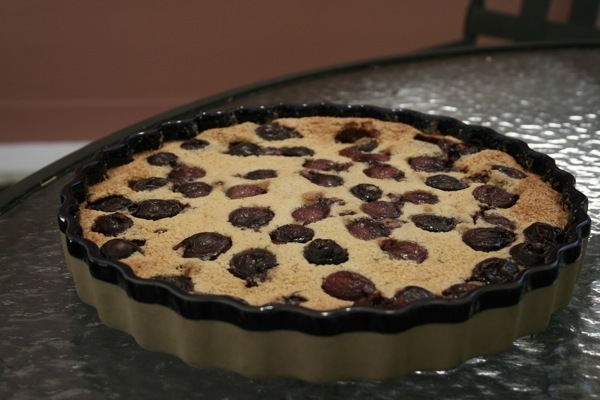 Not surprisingly, we also love any cherry sweet, from ice cream to pie, but my favorite use of cherries is the classic French cherry clafoutis, a simple and rustic dessert. Like American cherry pie, it’s cozy and charming, the perfect end to a summer meal. A clafoutis can best be described as a cross between a cake, a flan, and a pancake. It might sound a bit odd, but it’s hard to not fall in love with it. It’s rustic yet sophisticated, delicious warm or cold, and even good for breakfast, making it an extremely versatile baked good. While cherries are traditional to the dish, you can easily adapt the recipe for other summer fruit, from berries to peaches. It’s hard to go wrong. Since I can no longer eat gluten, I was afraid it would be difficult to find a comparable gluten-free clafoutis recipe. But leave it to the French. While flipping through blogger Bea Peltre’s La Tartine Gourmande cookbook, I stumbled upon her gluten-free cherry clafoutis. Not only does Bea use almond and millet flour, but she also substitutes coconut milk for the traditional cream, giving the dessert an exotic flair. Like a good gluten-free sweet, this clafoutis is just as delicious as its traditional floury counterpart. It’s properly firm and chewy, yet still soft and juicy from the cherries. The coconut milk imparts a tropical taste, as does the small amount of lime zest. It might just become your new favorite summer dessert. Hillary Pollak is a senior at New York University, where she studies sustainable food. She is loving the current bounty of berries. Preheat the oven to 350°F. Butter a 12-inch mold, sprinkle with sugar, and tap out the excess. In a small saucepan, heat both milks with the lime zest and vanilla. Once the mixture begins to boil at the edges, turn off the heat, cover, and let it steep for 15 minutes. Discard the vanilla pod. In a large bowl, mix the sugar, millet flour, almond meal, and cornstarch. Beat in the eggs, one at a time. Stir in the milk mixture and milked butter. Arrange the cherries in the mold, then pour the batter on top. Bake the clafoutis for 40 minutes, until golden in color and firm to the touch. Remove from the oven and let cool, then serve.